Rayko Ivanov Stantchev and his team have found a way to look inside computer chips. With terahertz radiation, they are able to look through materials that are otherwise opaque. 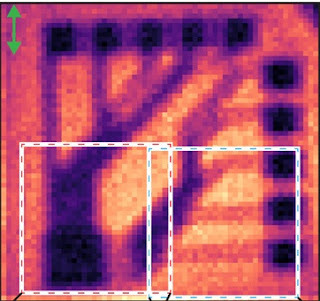 With terahertz radiation, we can look through computer chips, while still being able to see the structures inside it. To be able to look inside the chip, Rayko Ivanov Stantchev and his team beamed patterns of radiation onto a slice of silicon, the material most computer chips are made out of, that was only a hundredth of a centimetre thick. Because of this pattern, the silicon become transparent for the terahertz radiation. But the structures inside the chip don’t become transparent, enabling the scientists to see them. With this technique, they were able to find malfunctioning parts in the chip as small as eight micrometres across. That’s about half as thick as the finest human hair. The researchers consider using terahertz radiation a technique with much potential. For now, the possibility to see through silicon is limited by the thickness of the material, and the material can’t be really thick yet. Scientist predict that with improving the techniques, much thicker materials could be used. This can be really helpful with checking computer chips for malfunctioning parts, since the chips can just be ‘scanned’. But terahertz radiation has another interesting use. It could also be used in biology to scan tissues, because water, which is abundant in all living organisms, absorbs the terahertz radiation, making it easy to detect were there’s a lot of water. Because the radiation doesn’t bounce off of those spots. All in all a very promising technique that will benefit both computer sciences and biology.